Do you have favorite colors you always like to create with? I find there are colors I gravitate towards, and others that I almost never use. So recently I thought it would be good to challenge myself, to create something with colors I rarely use except as accents; gray and yellow. 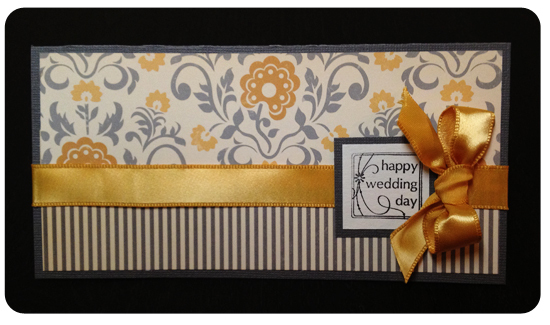 I kept the card very simple using some great papers from the Farmhouse collection by October Afternoon, and I was thrilled with how it turned out! Sooo, I thought I'd share a little inspiration with you too from time to time. 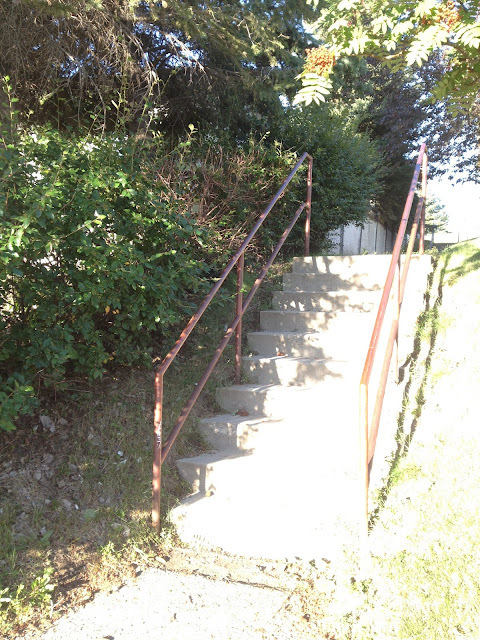 Without further ado, here is my first color inspiration for you. 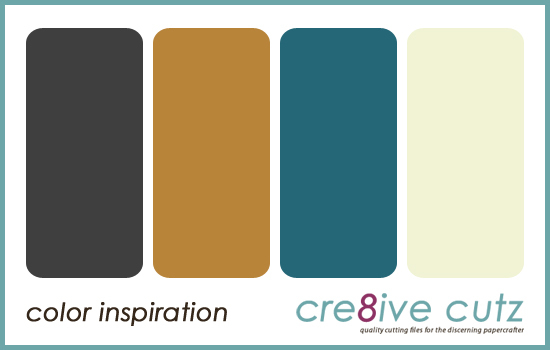 Feel free to use any or all of the colors in the palette to create a card, scrapbook page or anything else you have on your project list. And I would love to see your projects! 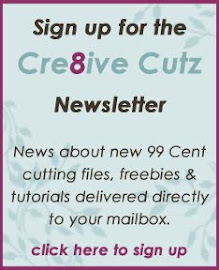 You can email photos to me, or post them to the Cre8ive Cutz Facebook page. Have fun! If you're like me, your iPhone has become the camera you always have handy, so lots of photos destined for the scrapbook are taken on it. I even went on a trip to New York recently with my sisters and my iPhone was the only camera I brought with me. In fact, all three of used our iPhones to take all our photos. Even though I didn't have quite as much control, I still got some great shots and preserved some wonderful memories. Given that for lots of us, phones are now our camera of choice in most cases, I thought I'd do a slightly different kind of tutorial for you today. 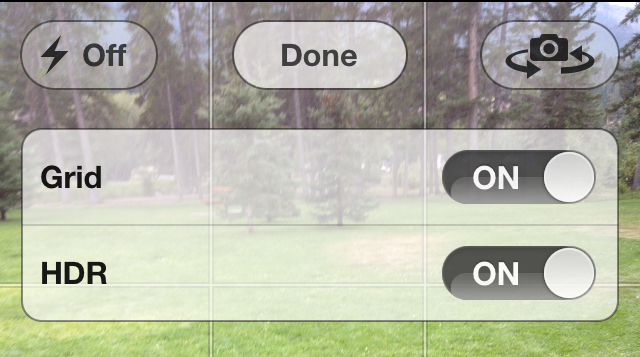 To turn on the HDR function, start your camera app then touch the Options button at the top of the screen. Move the HDR slider to ON, then touch Done. Now the fun starts! Experiment with touching the light and shadow areas on your screen to see the difference it makes in your HDR photo. 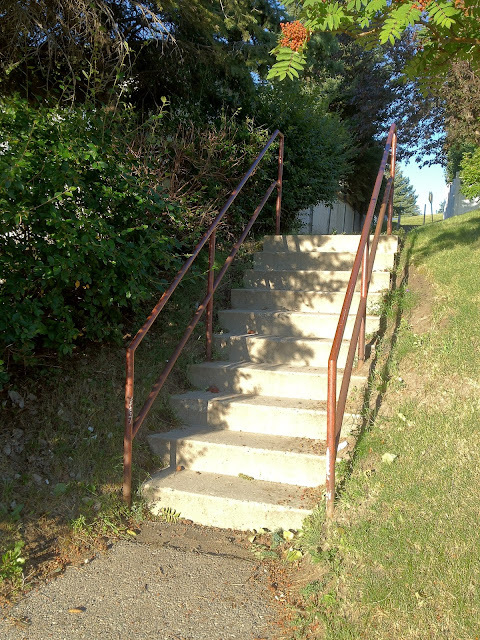 You can even try using HDR on photos that don't necessarily call for it, you might be surprised at the effects you get. One thing you do need to remember is that since your phone is taking two photos and merging them, it is a bit slower than taking a regular picture. So if you're taking photos of fast moving kids, it might not work out so well, but for scenery shots it's a great way to go. 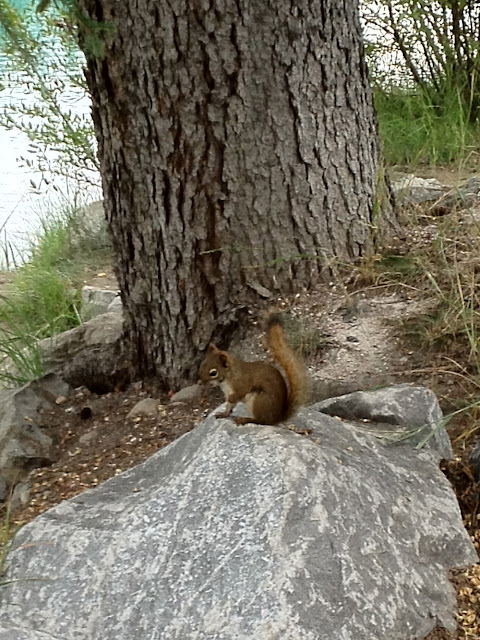 Here are a couple more photos I took on my iPhone. Neither of them actually needed to be HDR, but the effect that it gave was almost like slightly oversharpening the pic, in addition to popping the color a bit, which I thought was pretty cool. 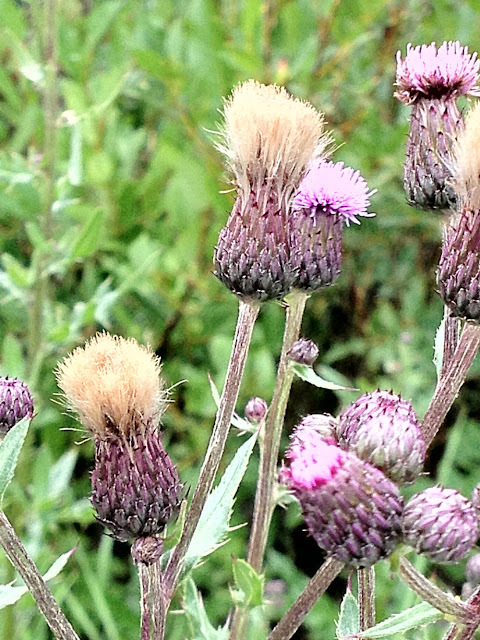 These are completely unretouched, straight out of the phone. Mouse over the pictures to see the same photo without using HDR. What do you give the person who has everything? 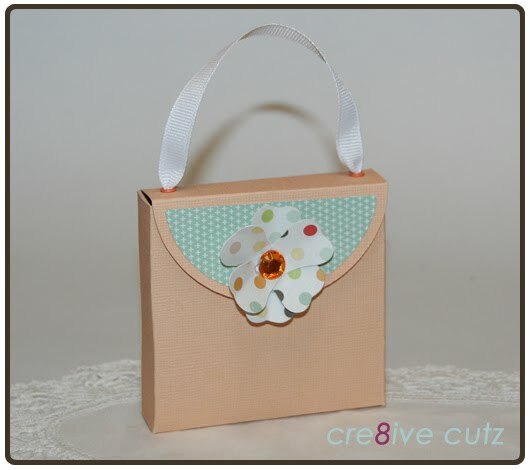 This cute and useful Mini Card Box, complete with cards and envelopes that they can use in their own gift giving. 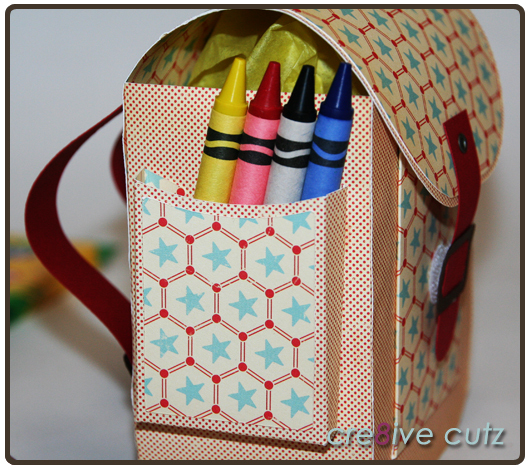 Or make a set for yourself to have on hand just in case, and store them in the pretty box until they're needed. Cutting files for the card box, a round card base, a square card base and the envelope are included. The cards as shown are approximately 3" x 3". The download includes SVG, MTC and PDF files as well as assembly instructions. The file cuts well on any size mat. New: For people without electronic cutters, a Print 'n Snip pdf version is also included that can be printed on the 8 1/2 x 11" paper of your choice and cut using scissors or a craft knife. 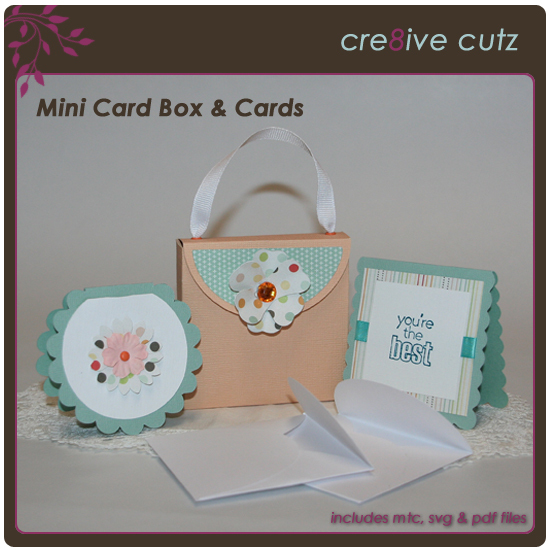 Click here or on any of the photos below to purchase the Mini Card Box & Cards. 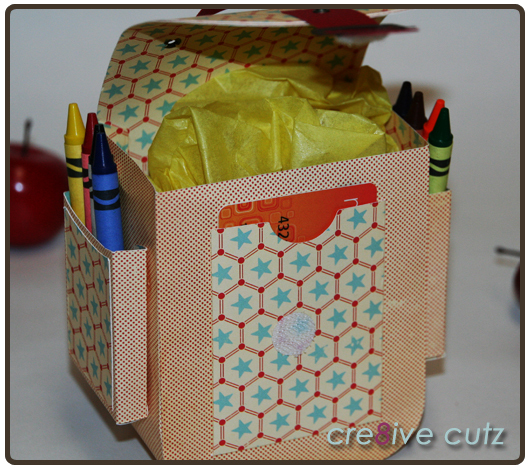 Store everything in the convenient and pretty card box. 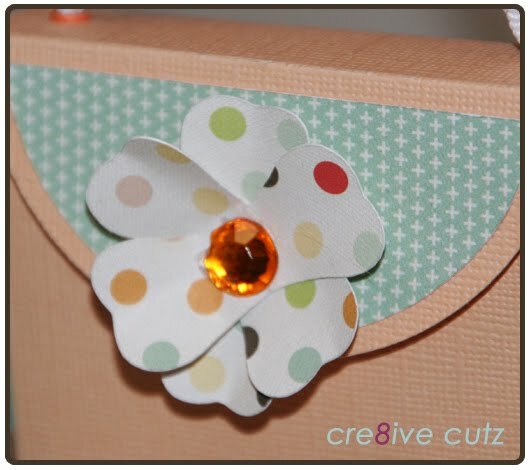 Complete the box with the included flower or a purchased embellishment. 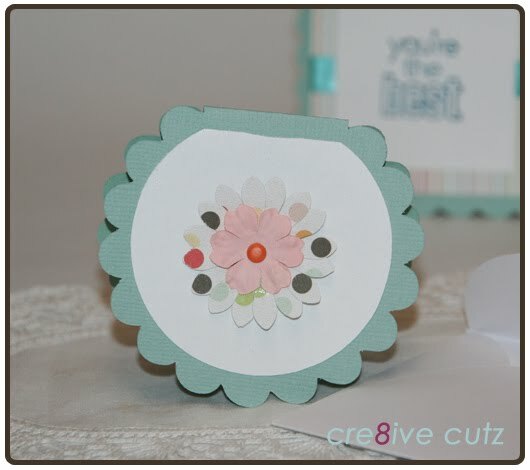 A round scalloped card base is included. 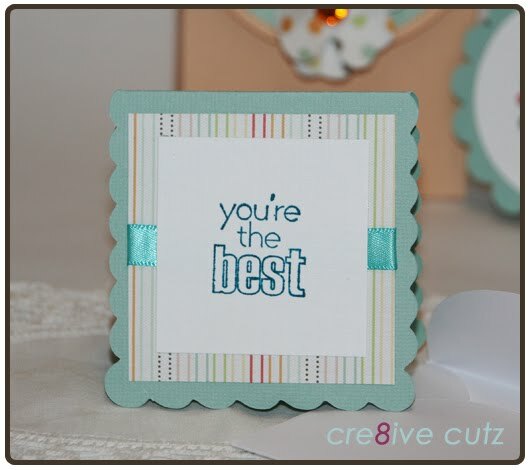 A square scalloped card base is included. 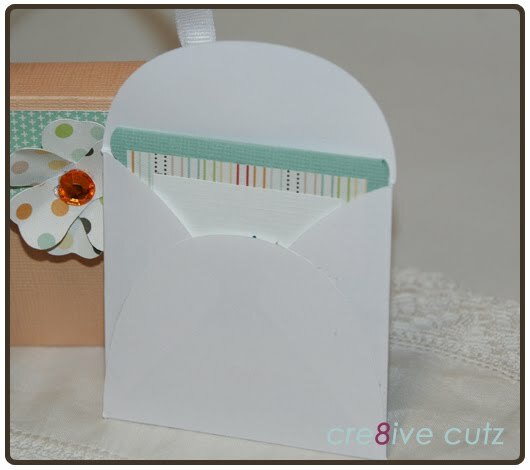 Make mini envelopes to match your cards. Hi everyone, I hope you're having a great summer! Ours has been busy, and it's not over yet, with two family weddings to go to before the end of August. 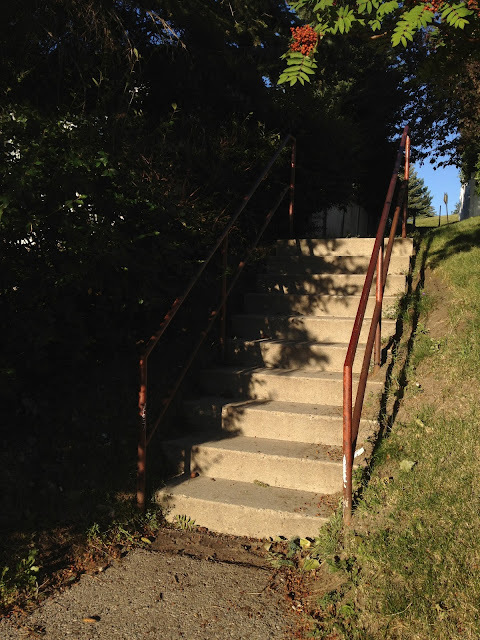 We're also going to be moving this fall, so it's going to be busy, busy, busy for a while yet! But, if you're like me, you still like to keep up on what's happening in the crafting world even if life is crazy. 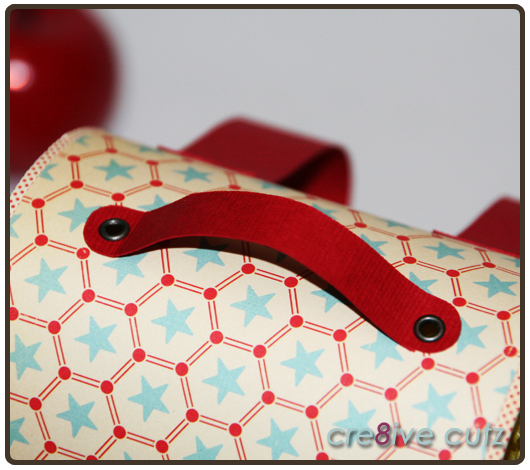 So, I wanted to share with you that Cre8ive Cutz is on Pinterest. I post pics of my 99 cent files, video tutorials, freebies and projects, of course, but I also post other inspiration like colors, cool techniques, and even cakes. If you'd like to follow me, you can find me right here. And that's not all, Cre8ive Cutz is now on Instagram too! Just search for cre8ivecutz on Instagram (available for iPhone and Android phones). I don't have too many pics posted there yet, but I plan to share projects in progress and lots of other fun stuff. And of course, if you don't already "like" me on Facebook, you should do that too 'cause there's something in it for you. 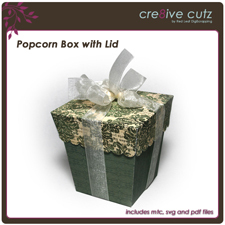 Everyone who clicks that little like button gets instant access to download this Popcorn Box cutting file as well as a video showing you how to put it together. Finally, by signing up for my newsletter (which goes out about once a week), you'll get all the latest news, new releases, freebies and tutorials delivered right to your inbox. I occasionally include free downloads exclusively for subscribers too. You can sign up for the newsletter right here. Happy crafting! Get the students in your life ready to head back to school with this Backpack gift bag, new in the 99 Cent Store. The Backpack features a large main compartment as well as a gift card pocket on the front and smaller compartments on the sides for extra goodies. The download includes SVG, MTC (for Make the Cut! software) and PDF files. Click here or on any of the photos below to check out the Backpack in the store. 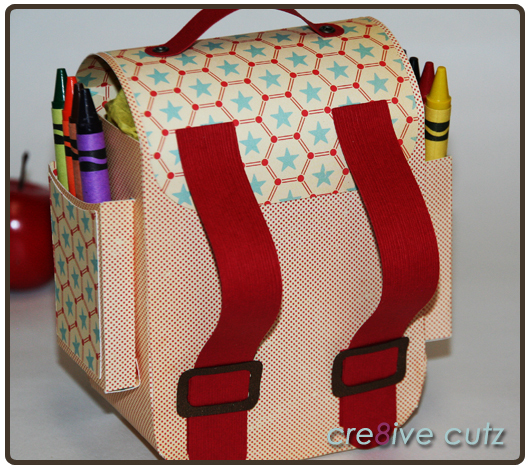 The backpack opens to reveal a large main compartment as well as a gift card pocket on the front. Side compartments hold extra goodies. 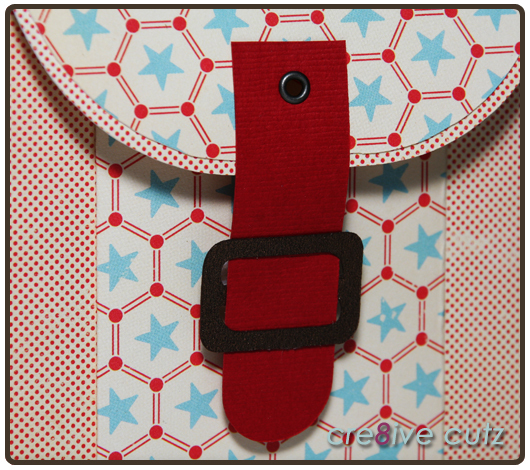 The shoulder straps on the back add the finishing touch. 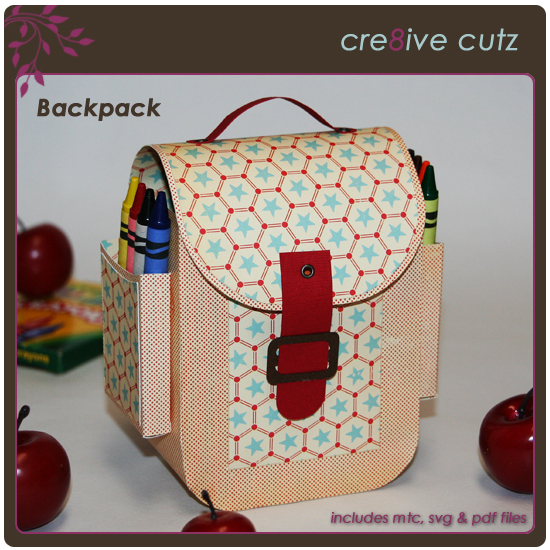 Velcro or magnets on the front buckle and strap hold the backpack closed once it's packed with gifts. The handy handle on top makes it nice and easy to carry the backpack.